This is a story, that I haven’t ever told before. A story that impacted my life in profound ways and is probably one of the reasons I have trust issues. Though time heals all things, these scars will never fade. It was summer vacation and my brother and I would hole up in upstairs portion of my house. We had a rotating cast of friends that would come over to hang out and chill. They’d stay for several hours and when we were finished they’d go home and the next day a new group of friends would come over. In all these groups of friends there was a constant. Let’s call her Mei (Short for Mei-Ling). Mei liked to hang out in the dangerous part of town along with her close friend Riki. Anytime there was a party you couldn’t invite just one, they were inseparable. As the groups cycled through, Mei with her beautiful purple hair became fixed in my young heart. Mei was behind the whole thing! As the betray happened, a scream erupted from my voice. How could this be! How could this happen? All the hour’s we had spent were a lie. Mei betrayed me, Mei betrayed Riki. I was crying, and my brother, my brother laughed at my misfortune. No matter how hard I tried to fight it, Mei was to strong for me. As Mei was crushing my dreams and my heart, I wept. The trust I had would never return. F*** you Mei, you’re dead to me. SaGa Frontier is one of my favorite RPGs. I'm glad you seem to have enjoyed playing it and it had an impact on you! 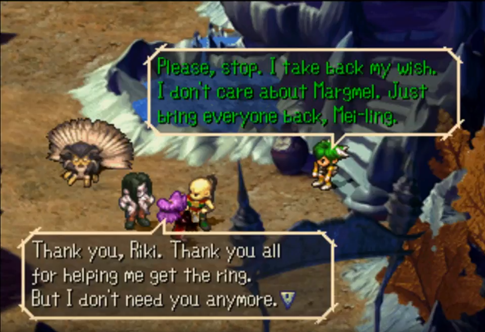 I agree that Mei-Ling is never welcome in my parties anymore. Appropriately named post, not a real story, after all these months of no girl blog in sight, and now this! You should be ashamed of yourself young man (ho I'm sorry am I assuming your gender, on a gaming website on the interwebs, ho yeah I'm, go to your room, no pudding, no digestive, barely will tolerate you getting tea, without a cloud of milk in it but flat!! FLAT I SAID! (did you see that I said flat, on the internet, I must be a crazy conspiracy weirdo...)). Why do we say "flat tea", but "black coffee"... wy not black tea or flat coffee... maybe because coffee "flat" is nothing close to fat it's the bitter thing in the world, but tea is kinda blackish without melk (is that the US or the UK pronunciation?). Thanks for the blog, I don't know this game, I'll probably be the one making what I loved the most out of all the type of blogs, a [Girl Blog]^TM of my own (on est jamais mieux servis que par soi-même). If everything goes alright I will!! I'll decide of your post's rating later, for now it's a shrodinger box, the betrayal was too strong, too soon to act on it straight away, one needs to control their emotions!